Ever since Saturday, April 25, 2015, the crypt where the body of Léonie Martin (1863-1941), sister of St. Thérèse of Lisieux, rested is no longer a place of contemplation and prayer for pilgrims. Long a true place of worship located within the Monastery of the Visitation, behind the City Hall of Caen, the place is now closed to the faithful. 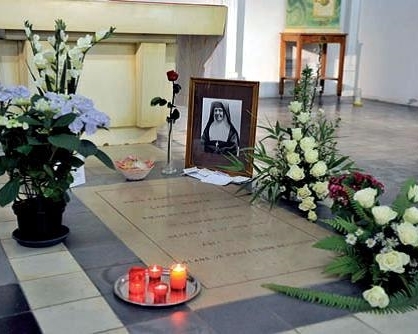 The exhumation of her body is the first clear sign of the launch of the process of the beatification of Léonie Martin, which was announced in January by Bishop Boulanger, Bishop of Bayeux-Lisieux. “It can take a very long time,” said Father Ruffray. A postulator has been appointed to monitor the various stages of the beatification process. This is Father Antonio Sangalli, a priest of Italian origin. He is also the vice-postulator of the cause for canonization of Blessed Louis and Zélie Martin, parents of Léonie and of Thérèse. - The above story is translated by Mary Davidson with thanks to TendanceOuest, where it appeared 4/29/2015. Please see the original story in French: "Béatification: le corps de Léonie Martin exhumé à Caen." 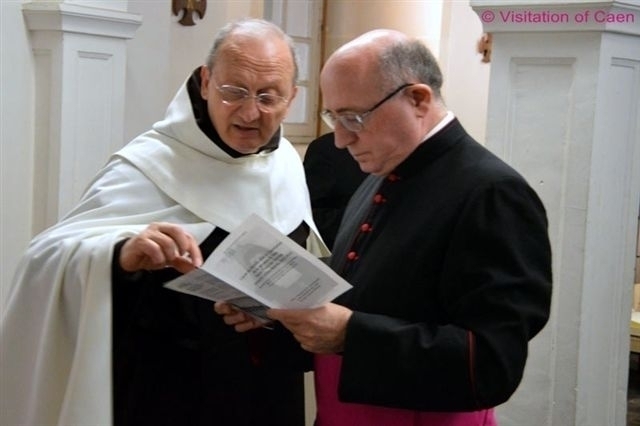 Father Sangalli, Postulator of Leonie Martin's cause, with Msgr Ennio Apeciti of the historical commission at the exhumation of Leonie's body, April 25, 2015. Father Antonio Sangalli, Leonie's postulator , with Msgr Ennio Apeciti of the historical commission. Msgr Ennio Apeciti of the historical commission; Jean-Claude Boulanger, bishop of Bayeux and Lisieux; and Fr. Olivier Ruffray, rector of the Shrine at Lisieux, at the exhumation of Leonie's body, April 25, 2015. Foreground, Fabio Reggazone, Fr. Sangalli' secretary; Msgr. Apeciti; Bishop Boulanger; Father Ruffray. The original coffin-plate of Leonie Martin, which was supplied by the funeral director in 1941, photographed after the exhumation, April 25, 2011. It gives her religious and civil names and the years of her birth and death.